Our pantomimes have been tremendous successes, with Cinderella winning the Rose Bowl best show award in 2010 and Babes in the Wood, which was written by our own Lizzie Lindsell, receiving a nomination for the same award last year. Lizzie has once again conjured up a show full of magic and love, fun and romance. Oh, and unfeasibly long hair! It’s packed with everything a pantomime should be – a wide range of music, dancing, jokes and silliness, not to mention a few surprises on the way. Tickets are available now, there are NO FEES for online bookings. The booking site is easy to use and provides a full seating plan from which to select your seats. Payment can be made with major debit or credit cards and transactions are processed securely through Paypal. Tickets are delivered by email as E-tickets for you to print and bring to the performance. Come and meet Dame Tatiana “Tatty” Topknot – the first still-married Dame to grace the Armstrong Hall stage. She’s running a hairdressing salon with her friend Bob, to take her mind off the disappearance of her baby daughter Rapunzel (and her husband Thomas), all those years ago. Cue a bunch of puns that will have you pinned to your seat or rolling in the aisles. Our grown-up and tower-bound heroine is wooed by the implausibly-named Prince Alberto Balsam, assisted by his horse, Chestnut. Throw in a ruthless villain, a useless fairy and some comedy mechanics and you have a hair- raising experience that will be the highlight of your year! 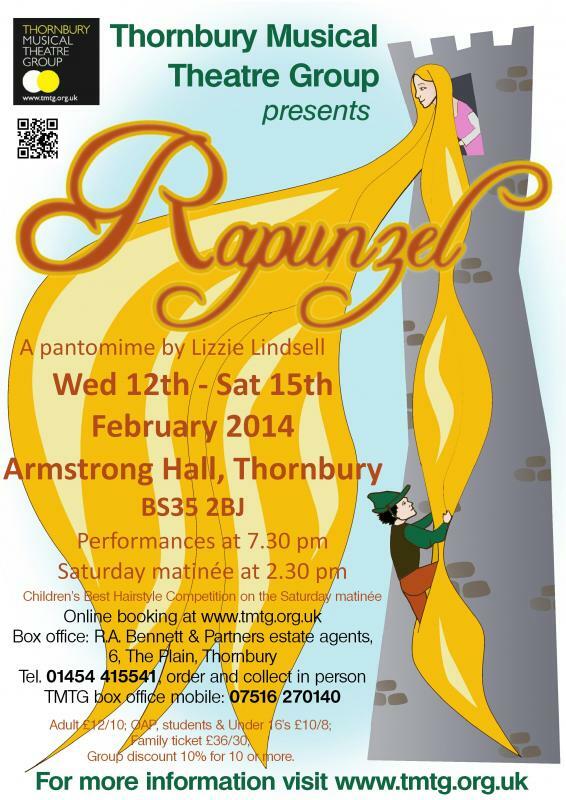 Only 3 weeks to go to this colourful and very entertaining family panto. You’ll need to get your skates on if you want tickets for Saturday, the matinee is sold out and the evening performance is fast approaching that too. But fear not, there are still plenty of good seats left for Wednesday to Friday evening performances. Please click on "Get Tickets" now to choose your seats and instantly get your tickets from just £8 – there’s no booking fee either! Click on “Productions” to find out more about the show. The auditions have taken place and the cast has been announced. What a tough job the audition panel had yesterday. The standard was so high and we know that we have an excellent show for you. Rehearsals have already started. Be sure to click "Get Tickets" above and book now as we expect tickets to sell quickly for certain performances, especially as there will only be one matinée this time, on Saturday. Congratulations to Lizzie Lindsell who wrote and directed 'Rapunzel', our 2014 pantomime, which has been nominated for the Chris Harris award for the best Variety/Revue/Pantomime. How poignant in the year when Chris, who was our patron, passed away.